Summertime at a ski area? Yep. Gunstock Mountain has added quite a bit to their activity plate for the summer. Your vacation in the Lake Winnipesaukee area will never be the same. 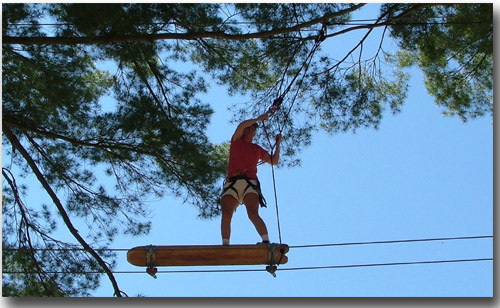 It's time to try an awfully big adventure with the new Aerial Treetop Adventure course at Gunstock. I first heard about this ropes course in a letter through the mail. I had no idea what a ropes course was like. But, I was game to try it. My daughter and I signed up and was I in for a big surprise! 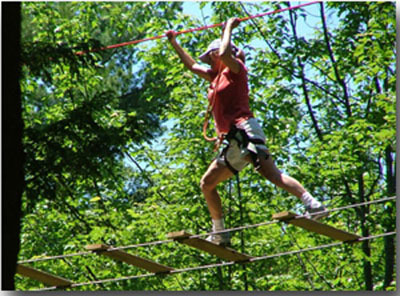 This is the largest ropes course in the continental United States. It has five courses that increase in difficulty as you move along. Its designed for ages 12 and older where you can reach to 5' 11" on your toes. If you can only reach to 5' 10" its even more difficult. A child must be accompanied by an adult on the course. There is an Explorer course for younger children aged 6 to 11 and can reach 4' 7" where a parent does not have to be on the course with them. To get started at the adventure play area at Gunstock, you need to sign a release form, get fitted for a harness and then receive a demonstration and rules about the course. This course preaches safety at all times. There are two safety lines with clips that you hook to a rope as you go through the course. Of course, there are guides throughout the course and on the ground to be there if you need help. There are five adult courses, green, blue, silver, red and black. We were in a group of about five people. My daughter was ahead of me. The green course turned out to be a piece of cake. You feel confident and think this is kid's play. There's a wobbly bridge, a barrel like contraption and a small zip line. As we moved along the course, one person in my group (who was ahead of me) got stuck on the vertical net. The net is fairly easy to cross but if you psych yourself out about it, you can panic and freeze. This person needed help to get across. By this time, my daughter was way ahead of me and I never saw her until the end when she was waiting for me. 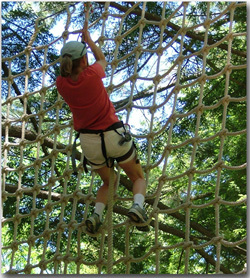 This adventure play area, ropes course criss-crosses back and forth through the trees. The more difficult courses are above and the easier ones are closer to the ground. As I moved along, I came across another wobbly bridge, but these rungs were not evenly spaced. This was my first challenge based on my petite height. Some were wider and I needed to kind of jump to reach the next rung. In my opinion, I liked the zip lines. They didn't require much work and I felt like I could do those all day. But, in order to get through the course, you have to do the games between the zip lines. So, its on to the next challenge. Between some of the new adventure games or challenges, you need to climb up a ladder. Ladder climbing sounds easy. It is... if it's at an angle. These ladders are vertical and take a lot of work getting up them. Do I Go Onto New Adventure Games? After the red course there's a tree with a ladder that goes up to the next course and also down to the ground. If you are tired at all, you should get off here. It's extremely difficult after this point (especially for a shorter person or someone that's not in the greatest physical or mental shape.) I wish I had gone down the tree instead of up. Now, for the black course. I came across staggered, suspended logs. I made it through, it wasn't too bad. But, then there were hanging rings to walk across. This was difficult as it was set up. My challenge was even harder. In the middle, one of the rings was wrapped around another one ahead of it. That took some swinging and stretching of my not so long arms to get it unwrapped. I was exhausted after that and wished I had gotten off at the tree. But... I continued. Towards the end of the adventure play area course, there was this challenge that you're supposed to pull yourself across the rope hand over hand while you are suspended. The rope has a slight incline at the en. I got most of the way and my arms were too tired to pull myself up the rest of the way. There was a guide that told me to come back and we could try another way. So, I did. He put my safety rope over the rope I had to pull myself with and clipped it to my harness. That worked perfectly...until I got to the other side. I couldn't unhook it. I was about one inch too short. The guide ended up climbing across to help me unhook it. By this time, about two and a half hours later, my arms were like rubber. Again, I wish I went down the tree at the red course. I still had to get across a surfboard. This would normally be easy, but not when you're tired. I did make it and my daughter was standing there waiting for me. Apparently, she went across the adventure play area course like a monkey and finished about an hour before me. 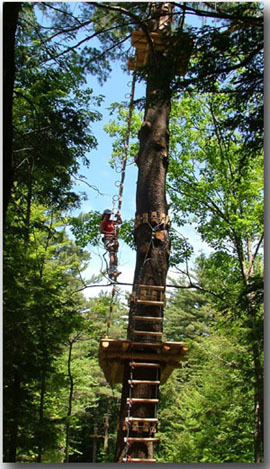 In the end, Gunstock's Aerial Treetop Adventure play area was a great experience, but if you are 5 feet or below or not in the greatest physical shape, I would recommend going down the tree after the red course.